The 777 offers the facility of using the APU to power an Air-Conditioning Pack during takeoff for those times when the departure is performance limited and you’re trying to squeeze every last Kg you can out of the takeoff while still providing some AC to the cabin (during the Takeoff). While a neat option, it comes with few issues when used during high ambient temperatures – which is typically when you are using it. 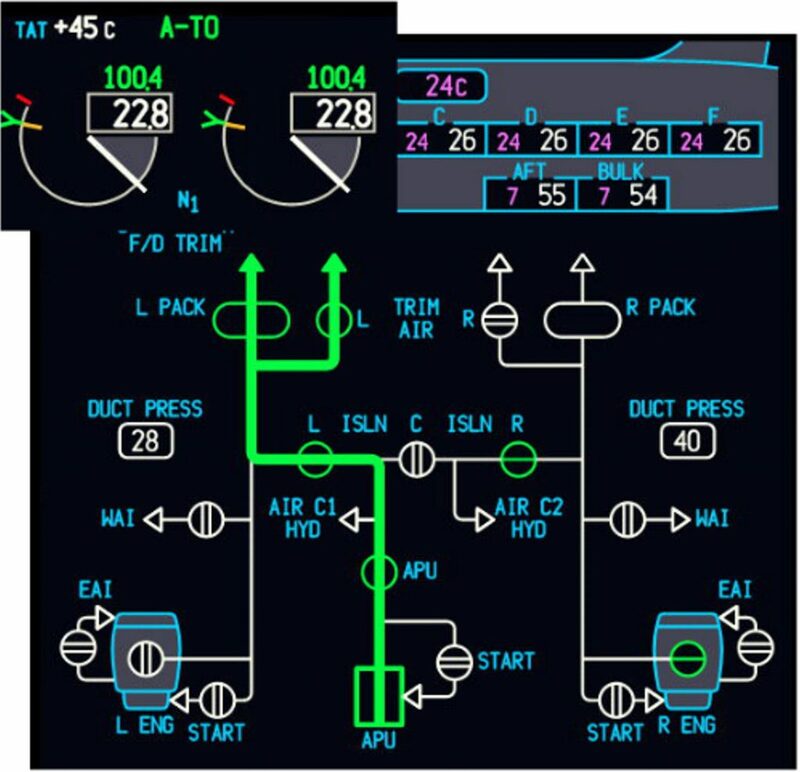 The FCOM SP on APU to Pack Takeoff includes a note advising that extended taxi in single pack configuration can result in excessive temperatures. It doesn’t highlight of course that typically an APU to Pack departure is the result of operation at heavy weights (high passenger load) in high ambient (performance limiting) temperatures. Hence excessive cabin temperatures are probably to be expected in all but the shortest taxi for departure. Anticipate the requirement and restore two pack operation early if required after single pack configuration has been established (second engine start). Leave the TAKEOFF SPEEDS DELETED message in the scratchpad and delay the Departure Review and Before Takeoff Checklist until the speeds are re-entered. Complete the Final FMC Performance Entry procedure to restore the speeds, checking all values remain. Anticipate a good two minutes to restore APU to Pack operation with all takeoff data entered/checked correctly. Some crew decide when briefing the departure that instead of having to enter the information twice – they will instead delay the Final FMC Performance Entry procedure until they are nearing ready for Takeoff. Hence, they start/push back without the FMC complete, establishing takeoff data and single pack operation only as they near the runway. This procedure is NOT recommended by Training/Standards. Instead complete all normal pre-departure data entry and if deleting APU to Pack as required – ensure you re-run data entry in full. Or … Consider a Packs OFF Takeoff.